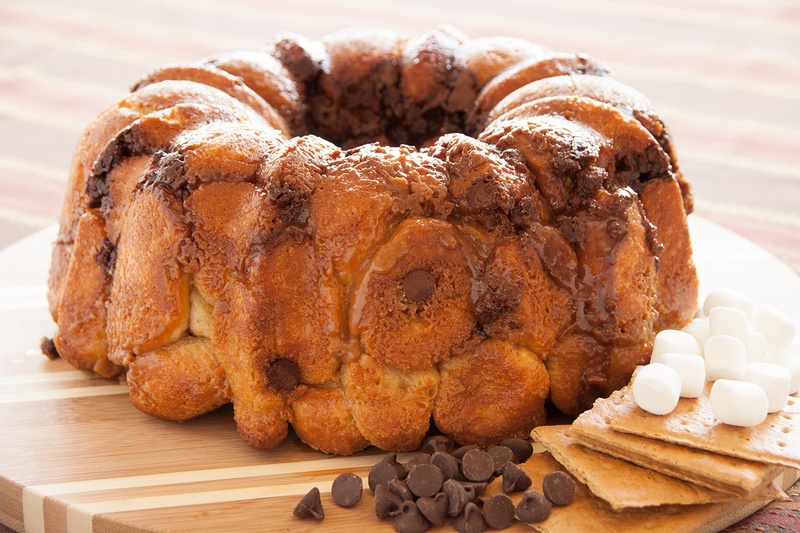 All the traditional flavors of s’mores combined in a delicious bundt. Cut rolls into fourths. Mix sugar and graham crackers together and put in a zip lock bag. Put several roll pieces in and shake to cover completely. Repeat until all roll pieces are coated. Layer about 1/3 of the following ingredients in a well sprayed bundt pan: coated roll pieces, chocolate chips, miniature marshmallows and any extra graham cracker mixture. Repeat to make three layers. Combine marshmallow creme, butter and vanilla in a sauce pan and cook on medium heat until melted and boiling. Cook and stir 1 minute. Let cool slightly and then pour the mixture over the contents of the bundt pan. Cover with sprayed plastic wrap and let rise until 1 inch below the top of the pan. Remove wrap and place bundt pan on a baking sheet. Bake at 350 degrees F 40-45 minutes. Cover bundt with foil last 15 minutes to prevent over browning. Remove from oven and immediately invert onto serving platter.